Four female Nigerian Writers are in Iseyin, Oyo State for the March/April 2018 Ebedi Writers Residency Session. 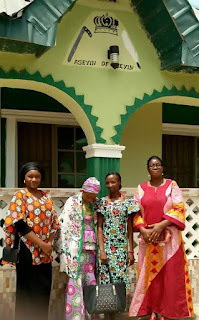 They are; Amina Hassan, Bukola Adeleke, Nana Sule and Funmi Aluko. Amina Hassan who is from Kano State writes in English and Hausa and graduated from Bayero University, Kano. In addition, she has certificates from Workshops organized by the Association of Nigerian Authors and Hausa Authors Forum both in Kano. In 2016, she attended another Workshop on TV Serial Drama Scripts Development organized by Women Empowerment For Development. In the same year, she won second position in the Women Short Story Competition (HIKAYATA) organized by the Hausa BBC Branch. 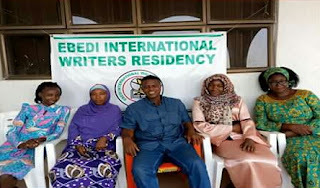 She hopes to spend her time in Ebedi to complete her new novel in Hausa and also to mentor secondary school students in Iseyin and environ in the art of Hausa songs and poetry. The second writer, Bukola Adeleke, a graduate of Adeyemi College Of Education, Ondo, Ondo State is a member of the Association of Yorùbá Language Authors known as Ẹgbẹ́ Òǹkọ̀wé Yorùbá, Oyo State Chapter. Bukola who writes in Yoruba, has two published works with numerous manuscripts which she hopes to complete during her stay in Ebedi. Apart from being a writer, she is also a Classroom Teacher and member of the Yoruba Teachers Association of Nigeria. Her hobbies include, travelling, reading, acting, dancing, singing, sports as well as making friends. It is her desire to pass some of these skills to secondary school students in Iseyin and environs during her Residency program. The third writer, Nana Sule an indigene of Kogi State is a graduate of the Federal University Of Technology, Minna. She currently works as an Editor with Amab Books and Publishers, Minna, Niger State. In addition, she is also an Event Manager and Programmer. Her hobbies include reading, research and writing. She hopes to use her time in Ebedi to complete work on her collection of short stories. She will also mentor Secondary School Students in Iseyin on the art of Public Speaking and Elocution. The Fourth Writer, Funmi Aluko is a Performance Poet and a Playwright. She has worked, written and directed plays, dances/dance drama with vulnerable/street children and children in conflict with the law; (generally Girl Children) as well as women and youth creative groups, (as a volunteer). She has also worked as the Creative Director/Coordinator of Pathway Initiatives in Nigeria. In addition, she has worked as a journalist, social worker and actress. She has been a member of Women Writers of Nigeria, Association of Nigerian Authors and currently the Treasurer of PEN International, Nigeria Centre. Funmi who is an Ebedi Fellow, having previously attended the Residency in 2014, plans to use her time in Ebedi to complete works in the areas of Fiction and Drama. She will also mentor Secondary School Students in Iseyin in the areas of Drama and Poetry.